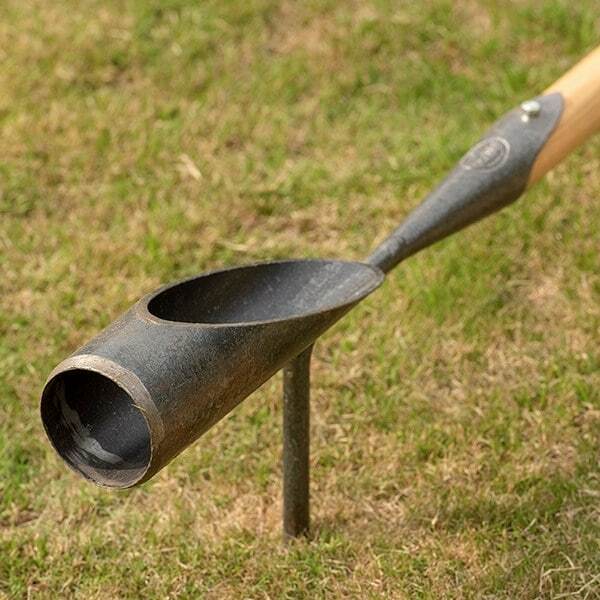 Buy De Wit tulip and daffodil bulb planter: <ul><strong><li>Long handle saves bending to prevent backache</li><li>Sharpened carbon steel head</li><li>Lifetime guarantee</li></strong></ul><br>This long-handled planter makes it quick and easy to create planting holes for your bulbs from a standing position.<br><br>With a sharpened steel nose and handy foot peg, the planter slices out a cone of turf or soil to leave a neat hole ready for planting. To use, just push it firmly into the ground, lift it out and remove the soil plug, plant the bulb and replace the soil.<br><br>You can easily create multiple holes of the same depth (11cm) with no bending, digging or measuring, and without disturbing other plants close by.<br><br>Like all De Wit tools, the planter is built to last from burnished carbon steel with an oiled ash handle. As the handle will naturally shrink over time, a locking nut fixes the head in place - letting you simply re-tighten it to keep the tool solid and strong.<br><br>Measurements:<br>Head 6cm wide (2.36”)<br>Total length 95cm (37.5”)<br><br><strong>About De Wit tools</strong><br><br>The Dutch are renowned for making the world’s finest garden tools, and De Wit is the most respected name of all. Founded in 1898, the family-owned toolmaker combines old-fashioned quality and craftsmanship with innovative design to create superior tools that last a lifetime.<br><br> Every tool is hand-forged in the Netherlands from tough boron steel - shaped, sharpened and burnished for durability, giving it the same blackened patina as traditional Edwardian tools. 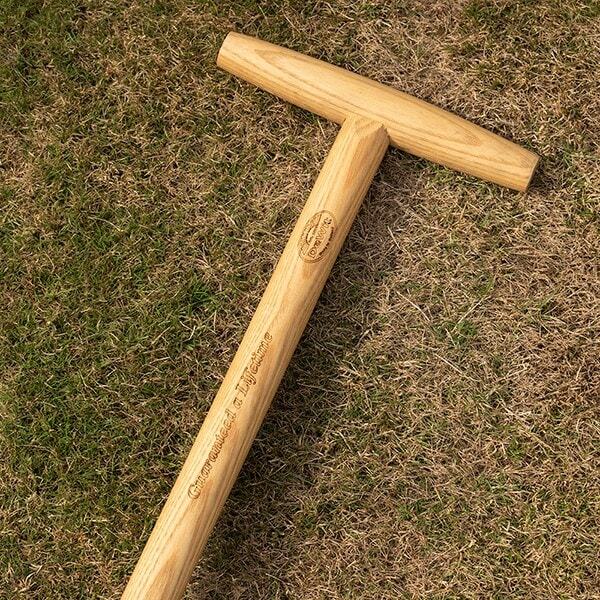 Each is fitted with an FSC-certified solid ash handle for ultimate strength and shock resistance, oiled to provide first-class protection against the elements.<br><br>All De Wit tools come with a lifetime guarantee against manufacturing defects, making them a truly once ina lifetime purchase. This long-handled planter makes it quick and easy to create planting holes for your bulbs from a standing position. 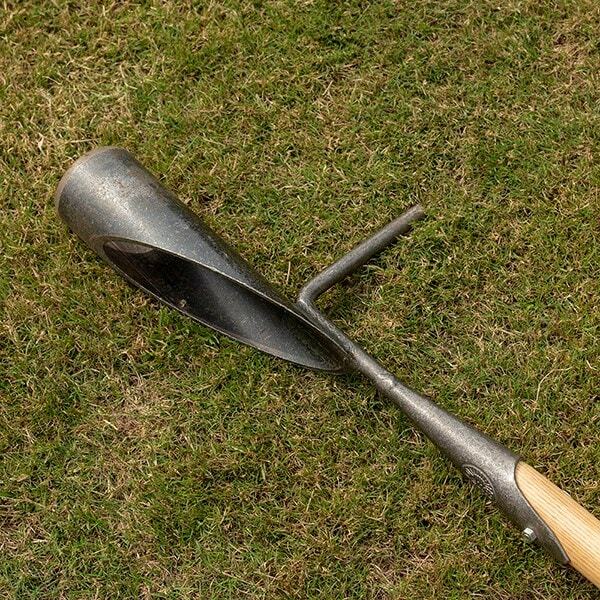 With a sharpened steel nose and handy foot peg, the planter slices out a cone of turf or soil to leave a neat hole ready for planting. 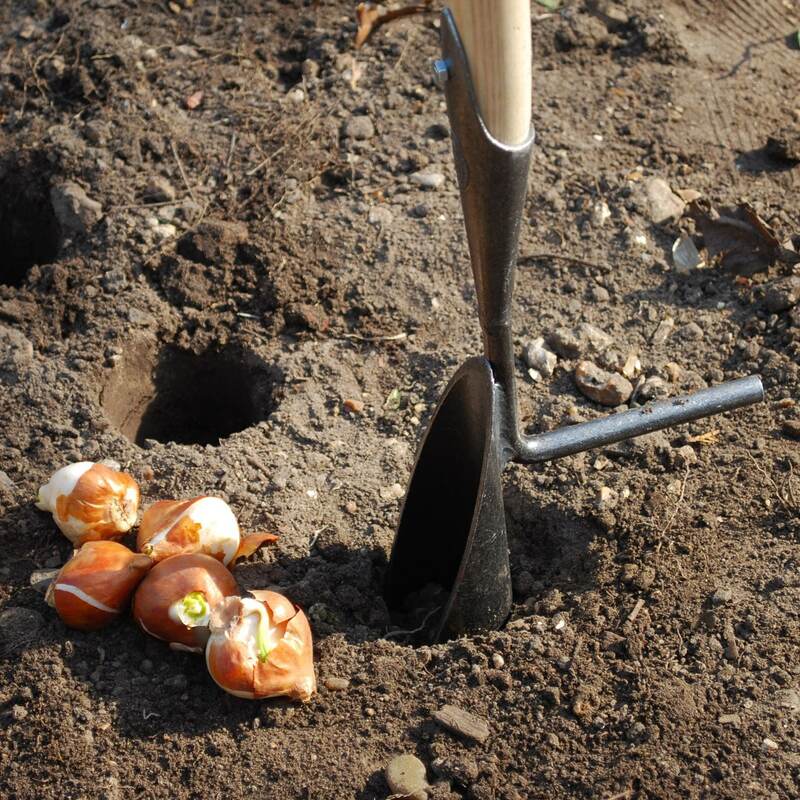 To use, just push it firmly into the ground, lift it out and remove the soil plug, plant the bulb and replace the soil. 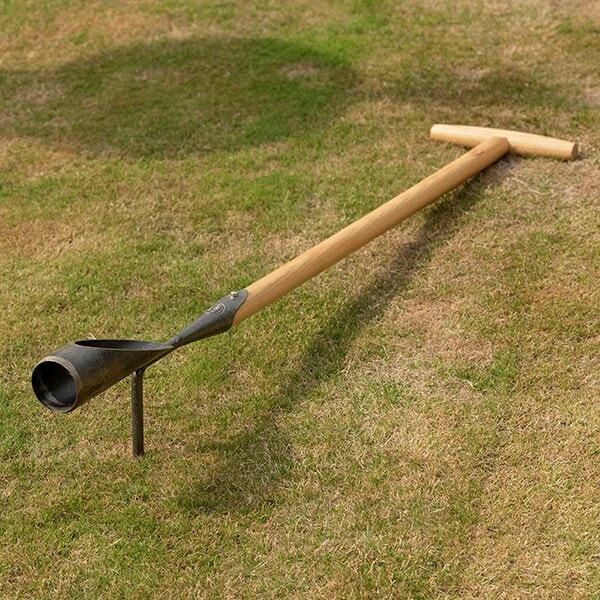 You can easily create multiple holes of the same depth (11cm) with no bending, digging or measuring, and without disturbing other plants close by. Like all De Wit tools, the planter is built to last from burnished carbon steel with an oiled ash handle. As the handle will naturally shrink over time, a locking nut fixes the head in place - letting you simply re-tighten it to keep the tool solid and strong. All De Wit tools come with a lifetime guarantee against manufacturing defects, making them a truly once ina lifetime purchase. 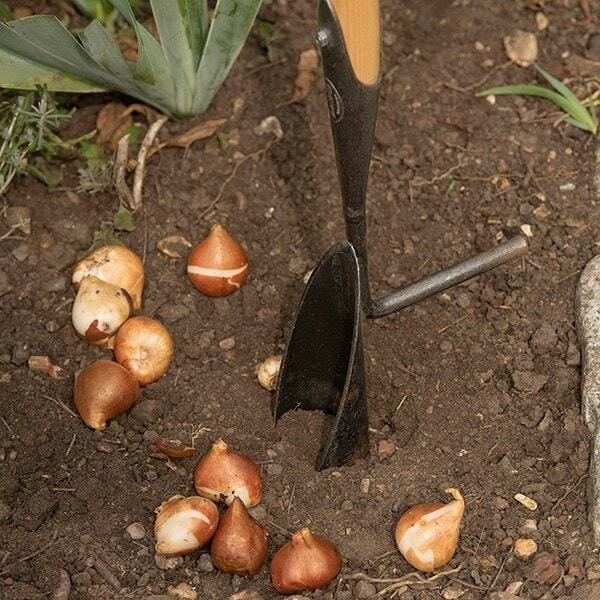 A great help when planting individual bulbs in lawns or borders. The footpeg is facing backwards which makes it awkward and bad for your knees. Also the mouth is straight which means the soil doesn't work itself out the top. Had a friend weld the footpeg to the side and cut and tapered the mouth piece. I am a professional gardener and have 1000+ bulbs to plant so ordered this planter since it seemed sturdy enough, which it is. Downside is that the footpeg is angled towards you instead of to the side making it awkward to handle.The footpeg is also placed too low, so you cant make the hole deep enough because the peg then digs in the ground. Finally, because of the non tapered shape of the planter, the soil does not come out of the top but compacts in the planter. Even with wacking the handle on the ground, (holding the planter upside down) it takes a number of good bounces to get the soil out, which in the long run will damage the handle. Maybe OK for planting 20-100 bulbs in a small garden but certainly not good enough for jobs bigger than that, I resorted to a normal border spade in the end. Please can you detail the depth of hole this tool is able to make? I am just concerned the foot rest will prevent a deep enough hole being made. Thanks. Hello there The depth will be 11cm. Hope this helps.